In the heart of the Múscraí Gaeltacht, Baile Mhúirne is a lush green valley by the banks of the river Sullane. It is surrounded by tree clad hills and rolling rugged terrain ideal for the enthusiastic walker who will be rewarded unexpectedly with breathtaking views on crossing the brow of a hill. Baile Bhúirne/Baile Mhic Ire itself is a thriving village with a growing population. Don’t miss the chance to sample the local Nine White Deer beer! Overlooking the village of Baile Mhúirne is St. Gobnait’s Shrine, a cemetery steeped in history and folklore and a great place of devotion and pilgrimage for locals and visitors alike for centuries. Saint Gobnait is the 6th century patron saint of Baile Mhúirne and has long been considered a protector and healer of all sorts of ailment. One story relates how she sent her bees as warriors to banish a band of cattle marauders and another tells of how she discouraged unwelcome invaders from settling in the area by thwarting their efforts at building a castle by knocking the buildings with relentless shots of her bowl. A strong bowling tradition still exists in Baile Mhúirne to this day. 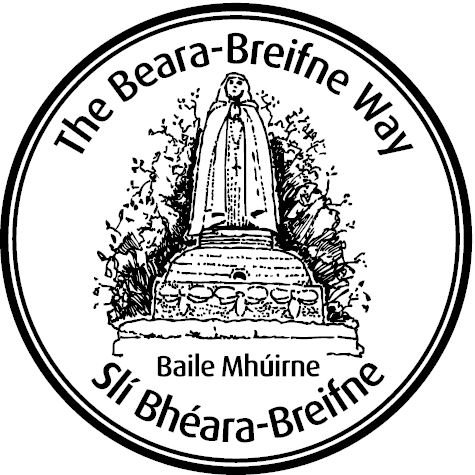 Ó Súilleabháin Beara himself and his followers prayed for good fortune at the Shrine as they made their journey northwards. Suite i bhfoisceacht coiscéim choiligh de theorainn Chiarraí, tá Baile Mhúirne ar an bpríomh bóthar ó Chorcaigh go Cill Áirne imeasc na gcnoc is na ngleann. 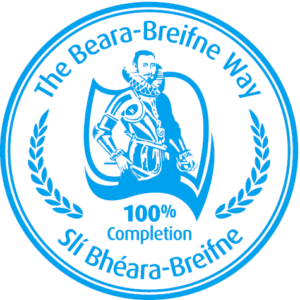 Ceantar sleibhtiúil lom í an Ghaeltacht seo in áiteanna ach tá an chuid is mó di faoi brat throm dhuilliúr le coillte agus foraoiseacha ag fás go raidhsiúil ar fud an bhaill. ‘S í Naomh Gobnait banphatrún na duithí – agus banphatrún na mbeach – agus tá fíor dheabhóid ag an bpobal di leis na céadta bliain. Tá stair ársa fíor shuimiúil ag baint le Reilg Ghobnatan mar a bhfuil Gobnait curtha agus mar a raibh mainistir aici sa 6ú aois. Bíonn triall ag oilirthigh ó chian is ó chómhgar ar an láthair seo i rith na bliana ar fad ag iarraidh leigheas agus faoiseamh ar Ghobnait. Tá Seán Ó Riada ceoltóir agus cumadóir, Seán Ó Ríordain file agus Diarmuid Ó Súilleabháin amhránaí, curtha sa Reilg seo i measc na scórtha eile ámhránaithe, filí, lucht seanchais agus ceoltóirí a choinnigh an cultúr agus an traidisiún beo agus ar bhéal na ndaoine go dtí an lá atá inniu ann. Ní ceantar mór turasóireachta í seo ach ceantar gnóthach fuinniúil le pobal líonmhar ag obair ins na comhluctaí atá lonnaithe in eastáit thionscaíochta de chuid Udarás na Gaeltachta. Tá pobal na h-áite an thugtha don gceol agus don amhránaíocht agus cé go mbíonn seisiúin ceoil eagraithe go rialta ins na tithe tabhairne, is minic a bhriseann seisiún níos fearr fós amach gan choinne agus cuirtear fáilthe is fiche roimhis an stróinséar a bheith páirteach sa scléip.